We had to say good-bye to Foncebadon early because we needed to hike up from the Convento at 1440 meters to the summit, at 1504 meters. From there it was to be all downhill. When we left, it was cold, dark, windy and foggy. We were the only ones leaving at that time. Soon other pilgrims passed us and we came upon others, too. We were certain that if it were not foggy, which it is most mornings, that it would have been beautiful scenery all around. 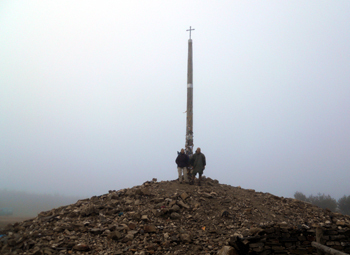 We were excited to get to the iron cross of Cruz de Ferro where there is a huge pile of rocks. It is tradition for each pilgrim who passes to place a rock on the pile. We got there and it was still FOGGY. We tossed our rocks on top of the pile, took photos and were off again. The fog didn’t lift for a couple hours and the wind was cold. Jackets stayed on most of the morning until the sun came out and stayed out. In the distance on the valley floor we could see Ponferrada. We also saw the nuclear energy plant and many industrial installations. It was just stunning scenery. The rocky way down was really brutal on the feet and the next day calves, glutes and feet were pretty sore and stiff. It took us until 3:45pm to arrive at Ponferrada and they asked the cook to stay so we could have lunch. Loved that! We arrived at Ponferrada beat up and walked through town until we found our quaint old hotel, opened in 1944. It reminded me of the Spain I first knew in 1975. It was NOT fancy, but the old elegance of high ceilings in the dining room and plaster work around chandelier was pretty. Rooms were again basic, but clean and nice. Bathroom was huge and there was even a sitting area. The television, which we did not watch was a 12-incher. I love living vicariously through you. I only wish I could be along on the trip! Hi Lisa: It sounds like your trip is a real adventure. Both challenging and fun. Thinking of you all here in Hawaii. Glad you like the protein snacks I sent with Dave. He has lots so just ask him to share! stay safe. love from all of us.